It's fair to say that Tim Burton hasn't exactly been on top form recently. I thoroughly enjoyed Alice in Wonderland but can't deny that it was horribly self-indulgent, while Dark Shadows was just a mess. 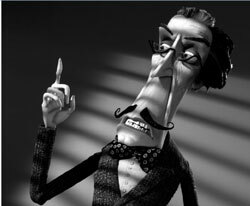 With Frankenweenie, however, the king of the gothic B-movie is back. Back, in fact, to his original form, the stop-motion animation movie being a reimagining of his first ever feature film, made for Disney and never afforded a proper release. In 1984 Disney, it seems, was not ready for Tim Burton. Fastforward almost thirty years and Frankenweenie suddenly finds itself one of three animated monster films released for Halloween, alongside Paranorman and Hotel Transylvania. 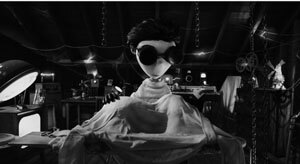 But while I've not seen the former, I'd wager that Frankenweenie is darker, weirder and just plain cooler than both films put together. Victor Frankenstein (Charlie Tahan) loves film-making, science and his dog Sparky. (He is, in fact, the young Tim Burton.) His parents worry that he may be lonely and weird, but in fact compared to his classmates (Edgar the creepy hunchback, Nassor the Boris Karloff lookalike and a bug-eyed girl who thinks her cat is psychic) he's positively normal. 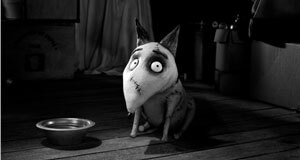 Frankenweenie may have been hammered at the box office by Hotel Transylvania, but it's a far superior film, every frame beautifully constructed and RKO B-movie picture perfect. Filmed entirely in black and white, the film is steeped in love for the classic horror movies which inspired it, with countless nods to the likes of Frankenstein, The Bride of Frankenstein, Nosferatu, The Fall of the House of Usher et al. As in Edward Scissorhands, Burton lovingly creates a fantastic, timeless, yet oddly believable world in which a seemingly idyllic, painstakingly normal suburb hides secret resentments and small-minded nastiness. And speaking of Edward Scissorhands, it is nice to hear Winona Ryder's voice again: the poster girl for weird chicks everywhere is back, playing the girl next door. Bless! Funny, inventive, deliciously dark and unexpectedly moving (yes I cried – you got a problem with that? ), it's an absolute delight from start to finish. Frankenweenie – franken brilliant!